Velcro is a youngster who has been with his current owners for only a month and a half. He was very lucky that Elizabeth just happened to discover him. He had been stuck like velcro in a tree for more than a week in another neighborhood where no one could or would do anything to help him. Since he was not very high, Elizabeth lured him down a little lower where she could grab him. She took him home with her and has lovingly kept him inside ever since. That is, until this day when he made a quick, unauthorized slip out the door. 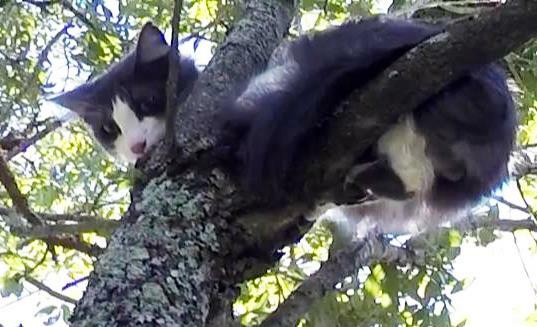 He quickly climbed the massive live oak tree in the front yard. By the time I arrived, he had settled about 30 feet high where I circled him in red in this photo. Velcro was a difficult rescue. If he had not been so afraid of me and had been more cooperative, it would have been easy. But this tree offered him multiple routes to go to get away from me, and he used them. At first I was expecting him to be cooperative, so I climbed up directly below him and tried to lure him closer to me with food. He was too afraid of me to come any closer. I could not get closer to him, so I decided to try to use my net to reach him. While I was close to netting him, I could not move the long handle of the net around the branch between us in such a way that I could secure him. He responded by walking laterally on the branch far away from me. I came down, removed my climbing line and reset it under him in his new location. This was a better location for me since I was now able to stand comfortably on a branch below him. From there, I attempted to snare him with my rescue-pole, but he managed to quickly slip through the noose before I could tighten it around his chest behind his front legs. I could tighten it around his waist, but I chose not to do that and let him go. Now he walked to the other extreme end of the branch. At this point I decided it would be best to just wait till in the morning before trying again. Hopefully, he would have time to forgive and forget all my rescue attempts and be more hungry and cooperative too. During my troubled night, I thought about how best to rescue this little guy. Since he had the advantage on mobility, I decided that I would just set a trap for him on his branch and then leave. When he went in the trap, I would go back up to retrieve him. I felt relieved to have this option and was anxious to do it. But Velcro had other plans. During the night, he climbed even higher and now perched in a crow's nest-like place and was very limited in where he could go. I could not set a trap in any location that he could reach, so my trap idea was now dead. However, at least now I knew he no longer had a mobility advantage over me. This time I set up a climbing line directly below him and another line from the opposite side that I could use to secure myself in the tree. Once I was in a comfortable and stable position, I used my rescue-pole to snare him. With his back to me and his long hair, I could not see well enough to know if I had the noose behind both his front legs or not. I knew I had one, but was unsure of the other. So I lifted him slightly and then I saw the other leg go in. As I was lifting him to bring to me, I thought I saw that I had him by only one leg, but after reviewing the video, I am sure now that I did indeed have both legs properly in front of the noose. Regardless, he handled the short ride to the net very well with no struggle or complaint. His owners were very relieved. Elizabeth was in tears by the time I reached the ground, and it is moments like this when I am reminded what an emotional impact these rescues have and how important it is to do. 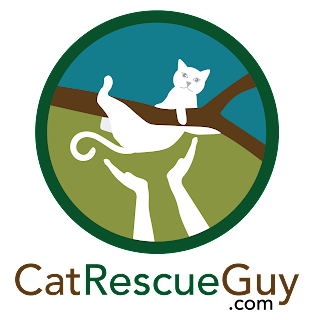 Rescuing cats out of trees is hardly the most important job in the world, but it has a profound meaning and value to the cat and the owners who deeply love them. That is important. And that is why this is so rewarding to me. 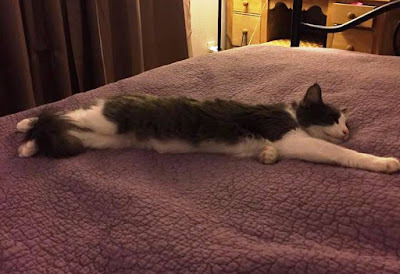 After Velcro got his fill of food and water and was secure in the knowledge that he was safe at home again, he stretched out on the bed for a very long and much needed sleep. Elizabeth took this picture of him then. I love seeing him all stretched out and sleeping comfortably like this after his miserable adventure. That's my reward. Money can't compete with the feeling this brings to me.